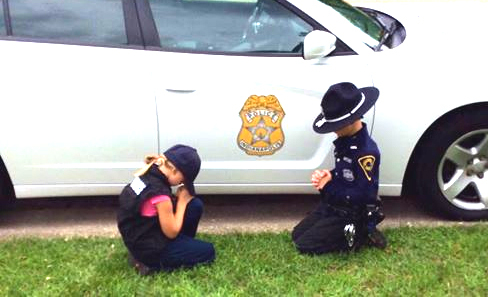 Following the tragic Baton Rouge shootings that killed three police officers and wounded three others, the Indianapolis Metro Police Department shared a moving photo of two kids praying in front of their dad’s patrol vehicle before he headed to work. “Praying their father and all police officers return home safely,” the caption read. According to WXIN, the two children shown in the photo are dressed in pieces of their father’s uniform. Since it was posted on Monday, the stirring image has already been shared nearly 5,000 times and received over 115 comments from those lamenting the current state of our country. “So sad… Kids shouldn’t have to worry about their parents being killed while they are working to protect people…” wrote another.